The terraced roof garden (above) and the entry porch (left), which looks like a folding camera. Wooden decking lends a tropical feel to this two-storey award-winning house in Namly Drive. Bedrooms (above) in the mini apartments of the Crane Road and a communal kitchen (below). Linkways (left) between the apartments double as communal areas where neighbours meet. Concrete stamping has been used to create textures on the walls of this three-room HDB flat. Its non-structural walls have been removed to let in more light (left) as well as to allow interior designer Jonathan Poh to create a "hotel suite" look (below). Visitors to the Verandah House in Bukit Timah might get a little wet when crossing between the two wings of the two-storey bungalow during the rainy season. While the upper floor is connected via a footbridge encased in clear glass, getting between the dining pavilion and the living room - both are on the ground floor - would require walking across a bridge that is built over the pool. While users are sheltered overhead, they are exposed to the elements at the sides. The design feature, introduced to adapt to rather than keep out the weather, helped the house earn its place in a new coffee-table book, Sustainable Luxury: The New Singapore House, Solutions For A Livable Future, by profilic design writer Paul McGillick. The book features 26 homes in Singapore, including a three-room HDB flat in Mountbatten. The Sydney- based author picked the homes based on the efforts of owners and architects in ensuring that the surroundings are well-preserved as they build a new home and how well they have adapted the architecture to Singapore's climate. In 2013, Dr McGillick, 68, wrote a similar book, The Sustainable Asian House, which features properties in Thailand, Malaysia, Indonesia, the Philippines and Singapore. Much like in his previous book, Dr McGillick's latest offering features houses that turn the common notion of sustainability on its head, beyond just looking at green features. Dr McGillick, who was the editor of prominent architecture and design magazine Monument in Australia, says: "Sustainability's a complex issue with a whole lot of things interacting. So I looked at it from the environmental, economic, social, cultural, personal and even spiritual perspectives. "It's all those things which make life liveable and keep something existing in the long term." He picked the Verandah House - it was named for the numerous covered balconies around the property - for providing privacy to individual members yet having communal spaces for them to gather or host parties. He writes in the book: "While the planning provides for separation, there is always a sense of connection because of the cross-views and high levels of transparency." Why the focus on Singapore this time round? Because the island-city is in a constant state of building and attracts many international architects, he says. Citing Australian architects who look to Singapore for inspiration because of the two countries' similar climates, Dr McGillick adds: "There're heaps of interesting and innovative work being done here. "People don't realise how cutting edge the architecture here is. The quality of domestic, residential architecture is very high and imaginative and there are clients who are willing to run with it." In particular, a shophouse in Neil Road stood out for him because its owners not only restored the house, but also made "fantastic new interventions". For example, an old airwell was kept, intricate fresco carvings of animals set in clay-like slabs were uncovered and a new extension housing a kitchen on the ground floor was created. The two-storey shophouse, which was built in the late 1800s, was a winner at last year's Architectural Heritage Awards given out by the Urban Redevelopment Authority. Ms Ho Renyung, co-founder of home-grown pants label Matter and daughter of the founders of resort group Banyan Tree Holdings, lives there with her Swiss-born husband, food and beverage entrepreneur Adrien Desbaillets and their dog. Dr McGillick, who took about two years to complete his book, says: "I like houses which have personal engagement. The young woman was committed to preserving the house and that sense of continuity was important to her. The new insertions fit beautifully with the old designs." The 224-page hardcover book is filled with stylish pictures of the exteriors and interiors of the homes, taken by Singapore-based award-winning photographer Masano Kawana, who specialises in architecture, interior and food photography. And it was not just huge and expensive homes that caught his eye. He was so impressed by a 721 sq ft HDB flat in Mountbatten - the only public housing home featured in the book - that he said he "fought tooth and nail" for it to be included in the line-up. Dr McGillick felt the home fit the theme of sustainability because it showed that old HDB flats can be given a new look and was buoyed that younger Singaporeans were opting to live in them rather than new condominiums or flats. He writes in the book: "This apartment is an excellent example of how existing - and in the view of many, obsolete - HDB apartments can be 'recycled', obviating the need for demolition and rebuilding." 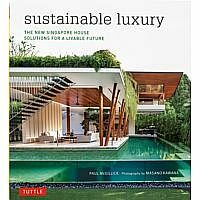 Sustainable Luxury: The New Singapore House, Solutions For A Livable Future (Tuttle Publishing) costs $50 before GST and is available at all major bookstores. Sitting on a hill, this 10,000 sq ft bungalow is home to a couple, their two children and their maternal grandmother. The facade, shaded by a tall tree marked for conservation, belies the expansive property inside. The Bukit Timah house was by Mr Rene Tan, Mr Quek Tse Kwang and Mr Charles Wee of home-grown firm RT+Q Architects and took two years to complete. Inside, the two-storey house is divided into two wings and connected by a bridge. One wing houses the dining pavilion and master bedroom, while the living room and children's rooms are in the other wing. On the open bridge, Mr Tan, 50, says: "To have such a bridge as the centrepiece is a dramatic look. For us, it was an experiment and it liberated the architecture from being too conventional." Taking advantage of the breeze the area gets and the elevated plot of land, the architects also designed many open spaces and floor-to-ceiling windows to create a well-ventilated house which does not need air-conditioning often. Mr Tan adds: "It is a simple house. There was no need for gold taps or marble flooring. Instead, we created a luxurious feel with the colour scheme and materials, such as timber and beige walls." The first thing interior designer and architect Jonathan Poh from home-grown firm Studio JP did was to remove all the non-structural walls in this three-room HDB flat in Mountbatten. This let in more light and allowed him to create the "hotel suite look" that the owner, a bachelor, wanted. The single bedroom opens up to the living room, which then extends to the dining room and a small, open kitchen. Mr Poh painted the walls white, put in a cement floor instead of tiles and used a technique called concrete stamping to create textures on the walls. The renovation cost $50,000 and was completed in 2011. Mr Poh says: "It was the first project I did interior design for. Four years on, I won't change the look of the flat - the materials will stand the test of time." This shophouse project started out as a restoration and redevelopment of one unit, 24 Crane Road. Later the owner, who works in the shipping line, bought the unit next door and turned both properties into a communal space. There are six mini apartments inside the shophouses, which are joined by spaces such as a courtyard, a public dining room and a reading corner. The apartments vary in styles - from the more open types to more private ones - and each is kitted out with its own amenities as well as a small kitchen and a toilet. Mr Mark Wee, 39, director of the Experience Design Studio, says: "Lifestyles have changed as compared with the days of old shophouse living. Now, people want their own private space, but they still want to be near one another. This house has many meaningful spaces which can be shared." The home owner, who is a fan of concrete architecture, drew up a wishlist when he commissioned architect Chang Yong Ter of Chang Architects to design a house here that would be similar to the one he owns in Penang. For instance, he wanted a house that looked naturally tasteful and could accommodate two families. He also told Mr Chang he wanted a tropical yet cool and breezy home as well as a minimalist house big enough to accommodate the large, extended family. The result is a two-storey 6,102 sq ft house - it has a basement and a mezzanine - that the owner lives in with his wife, their son, daughter-in-law and three grandchildren. Rooms are placed on different levels and airwells and plants are used as separators or shields to give the occupants privacy. Interesting spots in the house include the entry porch which looks like a folding camera and a terraced roof garden. Plants are also a big part of the landscape - a coral tree, eucalyptus, melaleuca, chillies, kangkong and ladies' fingers grow in the garden. A rain- harvesting system waters the greenery. The house cost $1.52 million to build and has won six awards including a World Architecture Festival prize in the Villa Category and a Design Award in the Residential Projects category at the annual Singapore Institute of Architects Architectural Design Awards. Mr Chang won all the awards in the last two years. He says: "The challenge was in striking a balance of the owner's requirements, which all seem very paradoxical at first.